An Australian cartoonist has defended his depiction of Serena Williams at the US Open, after the image went viral and was criticised as racist and sexist. Mark Knight's newspaper cartoon showed Williams jumping above a broken racquet next to a baby's dummy. Critics said it used racist stereotypes. The cartoonist denied it was racist, saying he had intended to depict only the tennis player's "poor behaviour". Some also said Knight had "whitewashed" Japanese player Naomi Osaka. 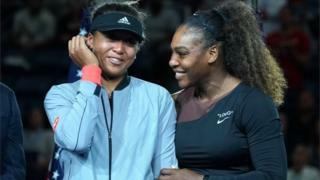 Williams sparked controversy during her loss to Osaka, whose father is Haitian and mother Japanese, when she accused the umpire of sexism and being a "thief". Knight's drawing was published in Australia's most-read newspaper, the Herald Sun on Monday, and referenced Williams's outburst and showed the umpire asking Osaka: "Can you just let her win?" It has been strongly defended by Knight and the newspaper's editor, Damon Johnston, who denied the cartoon is racist or sexist. "It rightly mocks poor behaviour by a tennis legend... Mark has the full support of everyone," he said in a tweet. The Herald Sun editor later tweeted a copy of Wednesday's front page - which reprinted the cartoon along with a series of others, hitting out at the "self-appointed sensors of Mark Knight". Critics, including author JK Rowling, compared the cartoon of Williams to past racist caricatures of African-American people. Others on social media pointed out that Osaka, who is mixed race, had been drawn as a white woman with blonde hair. The National Association of Black Journalists in the US denounced the cartoon as "repugnant on many levels". Rants, jeers and tears - 'most bizarre match'? "[It] not only exudes racist, sexist caricatures of both women, but Williams' depiction is unnecessarily sambo-like," it said in a statement. The 1899 children's book, The Story of Little Black Sambo, featured derogatory racial depictions - such as characters with thick red lips. Knight said he had "no knowledge of those cartoons or that period", saying on Tuesday that "the world has just gone crazy". "The cartoon was just about Serena on the day having a tantrum. That's basically it," he told the Australian Broadcasting Corporation. Knight also rejected a suggestion that he would not draw a similar image of a man. As evidence, he tweeted his recent cartoon of tennis player Nick Kyrgios. By 12:15 GMT on Tuesday, both his Twitter and Facebook accounts had been shut down. One sociology expert told the BBC that Knight had used "a genre that has a long history of racist impact". "The author may not even realise their own framing of the world has been shaped by history of racism in Australia," said emeritus Prof Andrew Jakubowicz from the University of Technology, Sydney. He said there had been "a tradition" in many Australian cartoons to exaggerate physical characteristics of minority groups, including indigenous Australians, to "trigger a reaction" - such as humour. Knight was also accused of racism last month for a cartoon which showed faceless black figures fighting in a Melbourne subway, a reference to a debate about African-Australian street gangs.